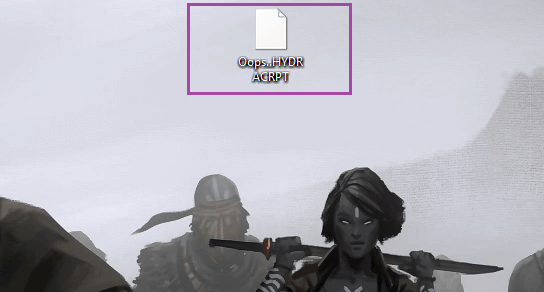 This page aims to help you remove HydraCrypt. These HydraCrypt removal instructions work for all versions of Windows. If you are reading this page it is likely because all of your files end in a strange file extension and a program called HydraCrypt is demanding that you pay a large amount of money in BitCoins in order to recover your file. You have actually been infected with a very dangerous malicious application that belongs to the Ransomware family of viruses. These viruses are incredibly dangerous, because your files remain encrypted even if you manage to remove the ransomware from your system. Do not despair – there is a free solution that can get you out of this mess. However, before we get there it is a good idea to take a look at HydraCrypt itself and to determine how you we infected in the first place. Generally, there are two major ways in which your PC may have come in contact with this ransomware. The most direct and obvious route is via a self-extracting ZIP installer, which contained the virus. Such archives are usually added as attachments to spam emails. Unfortunately, there are not always easy to spot – the quality and sophistication of spam Emails has been steadily increasing. Usually the hackers will try to make contact using fake word-related emails and the ZIP archive will supposedly contain some type of document – an order, an invoice or the like. Alternatively the package may have been downloaded from some fraudulent online hosting site or a torrent tracker. We strongly advise our readers to avoid downloading and installing software from uncertified sources. Many times everything will be OK, but that one time where you actually get a virus can be enough to ruin months of work or a lifetime of family photos. To be on the safe side always keep an anti-virus or anti-malware program and scan all files for viruses before opening them. A direct installation is unfortunate, but is actually preferred – the alternative means you have a Trojan horse on your computer. Ransomware viruses have become popular enough so that hackers develop Trojan horses specifically designed to install the ransomware on any computer they infect. Trojan horses can be installed by clicking on corrupted links, running email attachments, clicking on dangerous Ads or videos. A Trojan horse can remain hidden on a computer for a very long period of time and triggered remotely on demand. If you suspect that the ransomware may have been installed with the help of a Trojan horse you absolutely must find the Trojan and deal with it before attempting to recover your files. This is very hard to do manually – Trojan horses are notoriously hard to spot and can mimic the processes of other files and windows services. Your best bet for locating the ransomware is using an automated scanner to sweep your entire computer. You can look for our recommendation below. Absolutely not. Only consider paying as a last ditch effort if all other options have been exhausted. You are paying blackmail money to cyber criminals, who are encouraged to improve their virus and try to re-infect your computer AGAIN in order to milk more money. You also have zero guarantees that you’ll get your data back and as they say – no honor among thieves. HydraCrypt may have created some form of scare message to deter you from seeking help online. The truth is that as long as you leave the encrypted files intact you can always resort to paying the ransom. The method detailed in our guide will not touch this files in any way. Instead we’ll try to recover the original files that were deleted. The ransomware virus did not transform your files – when it encrypted them it created the new encrypted files based on the originals, then deleted the originals. Thus recovering these original files is actually very similar to recover accidentally deleted files. Symptoms All files encrypted, blackmail money demanded to ransom the encrypted files. Distribution Method Email attachments, Trojan droppers, torrents and fake download sites. Do not skip this. HydraCrypt may have hidden some of its files. The first is a full system restore. 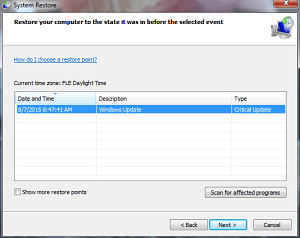 To do this type System Restore in the windows search field and choose a restore point. Click Next until done.